I read an article regarding to frostbite this morning and I would like to share with my readers. Everybody knows that when water put into the freezer will turn into ice cubes. So imagine what will happen if a human body will be exposed long enough in freezing temperature? Remember, the human body is composed mainly of water. You get frostbite. It’s like being burned from a very hot temperature that your tissues are damaged and the blood circulation on that area will be deprived. Sometimes, amputation have to be done for serious cases. 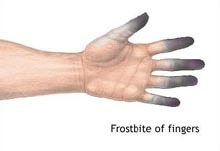 Frostbite is a serious medical emergency and has to be seen immediately by the emergency physician for proper medical intervention. They usually do immediate re warming and prescribe ibuprofen for its anti inflammatory effect. While this is the emergency intervention, this may not be complete remedy to prevent further tissue damage and for tissue healing. It’s important to know that there is an available remedy just around the corner. A generous helping of aloe vera gel to the affected area will prevent further tissue damage and promote tissue healing. You may use the pure and fresh gel form the leaf or the aloe cream form. Apply it at least four times a day and surely the frostbite will heal without tissue scars specially for smaller areas like the fingers and toes. Apparently, frostbite blisters contain chemicals called thromboxane and aloe plant could inhibit formation of this chemical thereby promoting faster tissue healing. There you have it, a simple aloe can save you from the dangers of frostbite. 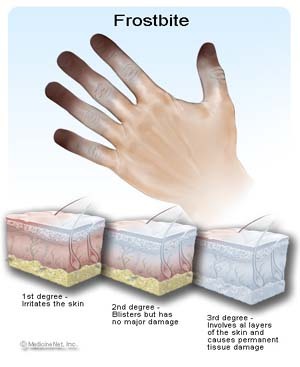 The levels of frostbite condition. Image courtesy from Medicine Net. Visit myHealthcareReviews.com for more articles.